Baby size: We've got a mango cooking! 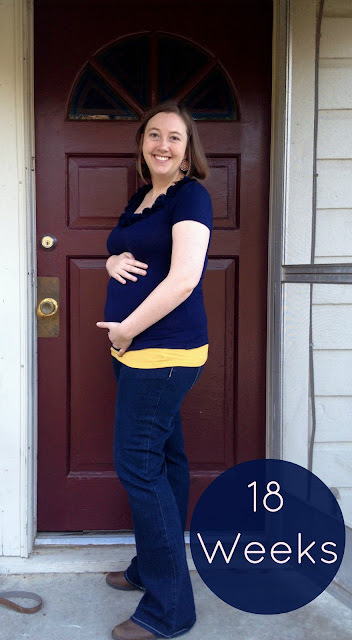 What's new: I finally succumbed and bought a few pairs of maternity pants. And I adore them! I finally don't feel uncomfortable or like I have nothing to wear :) I also finally feel like I look a little more pregnant and not just chubby in the belly! Symptoms: Heartburn has become more and more likely--so I've been keeping the Tums handy and trying not to eat too much at one time. I've also been a bit sore + achey--usually at the end of the day. But baths, exercise, and stretching help a lot. Movement: I still don't feel a lot of movement--still mostly flutters. At church, I felt the baby fluttering around a lot during the worship set. I guess he/she loves music like their momma! Exercise: Still doing mostly prenatal yoga and walking. I want to do more weights/strength but am a but more lazy about doing those. What I miss: I miss sleeping through the night since I get up four to five times a night for a potty break and to get comfortable. I'm sure, though, that it will just get worse, so I know I can't complain too much! Even though there is alway uncertainty, nerves, and newness about this process, I am so excited to experience growing this little life. How exciting. You should start feeling the kicking pretty soon. Glad you're feeling overall pretty good.